As a bird owner it is important to keep a bird emergency kit on hand. You never know what could happen. 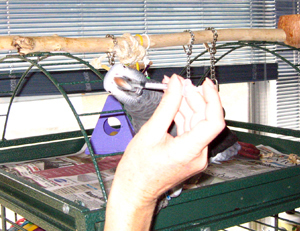 Make sure you are prepared to handle an emergency situation that might arise with your African Grey. Whether it be a medical emergency or natural disaster, be prepared. Most of these items can be purchased at a local store. If you don't have one already, put one together for your piece of mind and your bird. Note: We cannot stress enough, if your bird is injured or sick, please contact your avian veterinarian immediately.